Communist forces began digging a network of tunnels under the jungle terrain of South Vietnam in the late 1940s, during their war of independence from French colonial authority. 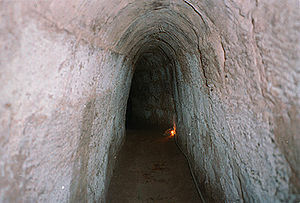 Tunnels were often dug by hand, only a short distance at a time. As the United States increasingly escalated its military presence in Vietnam in support of a non-Communist regime in South Vietnam beginning in the early 1960s, North Vietnamese and Viet Cong troops (as Communist supporters in South Vietnam were known) gradually expanded the tunnels. At its peak during the Vietnam War, the network of tunnels in the Cu Chi district linked VC support bases over a distance of some 250 kilometres, from the outskirts of Saigon all the way to the Cambodian border. As the United States relied heavily on aerial bombing, North Vietnamese and VC troops went underground in order to survive and continue their guerrilla tactics against the much better-supplied enemy. In heavily bombed areas, people spent much of their life underground, and the Cu Chi tunnels grew to house entire underground villages, in effect, with living quarters, kitchens, ordnance factories, hospitals and bomb shelters. In some areas there were even large theatres and music halls to provide diversion for the troops (many of them peasants) and their supporters. 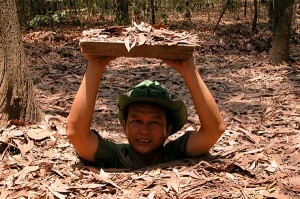 In addition to providing underground shelter, the Cu Chi tunnels served a key role during combat operations, including as a base for Communist attacks against nearby Saigon. VC soldiers lurking in the tunnels set numerous booby traps for U.S. and South Vietnamese infantrymen, planting trip wires that would set off grenades or overturn boxes of scorpions or poisonous snakes onto the heads of enemy troops. To combat these guerrilla tactics, U.S. forces would eventually train some soldiers to function as so-called “tunnel rats.” These soldiers (usually of small stature) would spend hours navigating the cramped, dark tunnels to detect booby traps and scout for enemy troops. In January 1966, some 8,000 U.S. and Australian troops attempted to sweep the Cu Chi district in a large-scale program of attacks dubbed Operation Crimp. After B-52 bombers dropped a large amount of explosives onto the jungle region, the troops searched the area for enemy activity but were largely unsuccessful, as most Communist forces had disappeared into the network of underground tunnels. A year later, around 30,000 American troops launched Operation Cedar Falls, attacking the Communist stronghold of Binh Duong province north of Saigon near the Cambodian border (an area known as the Iron Triangle) after hearing reports of a network of enemy tunnels there. After bombing attacks and the defoliation of rice fields and surrounding jungle areas with powerful herbicides, U.S. tanks and bulldozers moved in to sweep the tunnels, driving out several thousand residents, many of them civilian refugees. North Vietnamese and VC troops slipped back within months of the sweep, and in early 1968 they would use the tunnels as a stronghold in their assault against Saigon during the Tet Offensive. In all, at least 45,000 Vietnamese men and women are said to have died defending the Cu Chi tunnels over the course of the Vietnam War. In the years following the fall of Saigon in 1975, the Vietnamese government preserved the Cu Chi tunnels and included them in a network of war memorial parks around the country. Visitors to Vietnam can now crawl through some of the safer areas of the tunnels, view command centres and booby traps, fire an AK-47 rifle on a firing range and even eat a meal featuring typical foods that soldiers living in the tunnels would have eaten. With thanks to the History Channel.